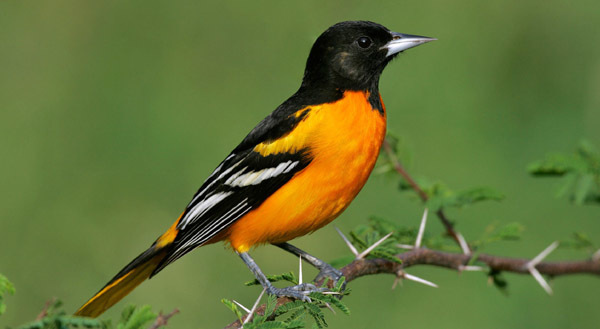 Many of the highlights of spring revolve around returns of wildlife from wintering locations, including fish and birds. This week the anticipated end-of-May passage of brant occurred with many thousands of these small geese heading upriver toward their Arctic breeding grounds. 5/19 – Newcomb, HRM 300: The black flies were certainly out, but were not too bad so far. We were just getting our Cloud-Splitter Outfitters operation going for spring and are waiting for the trout anglers to show, now that the Hudson River has adjusted to seasonal levels and water temperature. 5/19 – Hunter’s Brook, HRM 67.5: We picked the glass eel fyke in a cold, driving rain. The water temperature had dropped seven degrees Fahrenheit in ten days (58 degrees F). The glass eel “run” in from the sea was slowing down as we collected only 15 glass eels and six elvers. 5/20 – Minerva, HRM 284: A bunch of just-for-fun kayakers and canoeists (including children) started out in the rain heading down the beautiful Minerva Stream. It was a 90-minute slow paddle from the put-in point to the take-out point. About mid-way, in a broad, very fine, mixed swamp/marsh with lots of snags and beaver dams, we saw eight turkey vultures slowly winging around or hanging out in a few of the snags. It had been very wet, and these birds were lurking in the dead branches with their wings spread out, apparently drying them. I don't think I've seen that sort of communal wing-drying before. It reminded me of being in Florida and seeing anhinga drying their wings. 5/20 – Greene County: We paddled across the river to bald eagle nest NY203 this morning and spotted an adult eagle on a nearby shoreline tree and another one perched on the rim of the nest. No nestlings were in sight. We watched for ten minutes without seeing anything more. There was an immature eagle on a mud flat log nearby, but it looked too much at ease to be a new fledgling. Last year NY203 produced a pair of fledglings. 5/20 – Town of Poughkeepsie: The pair of nestlings in bald eagle nest NY62, now 58 days old, welcomed “Dad” into the nest carrying a foot-and-a-half-long striped bass. The nestlings were eating well. 5/20 – Hunter’s Brook, HRM 67.5: Short shallow tributaries frequently show significant short-term changes in water temperature. A cold night or a hot day can cause it to rise or fall. Such was Hunter’s Brook when we picked the glass eel fyke net today. The water temperature had risen seven degrees F in 24-hours (65 degrees F). Our catch continued to dwindle with just eleven glass eels and three elvers. 5/21 – Coeymans Landing, HRM 133.5: In just an hour’s time, I watched six flocks of brant, 1,225 birds, pass over Schodack Island heading north. 5/21 – Ulster Park, HRM 87: For at least three hours this evening, I watched, non-stop, huge flocks of brant flying up the river. I must have seen at least a dozen flocks with thousands of birds. 5/21 – Norrie Point, HRM 85: The cove at Norrie Point was getting shallow as the tide receded. Fifty 6th graders from Kinry Road Middle School were with us to help sample the Hudson River’s aquatic life. Before we even wet our net, we counted six northern water snakes (Nerodia sipedon) slithering through the shallow with just their heads out of the water. Despite being a harmless, non-venomous snake, the students were spooked. As for the fish we caught, they included pumpkinseeds, redbreast sunfish, bluegills, spottail shiners, tessellated darters, white perch, and both male and female banded killifish. The river was 65 degrees F.
5/21 – Beacon, HRM 61: It was a bountiful day carp fishing. While none of them were big, I ended up catching and releasing seven. I did not weigh any of them but I estimated they ranged from 2-8 pounds. I lost several others between hookup and landing. Any day one catches more than two carp is a big deal. For the first time this season, I saw carp breaking the surface indicating the onset of their spawning season. Finally, Kudos to Scenic Hudson. They cleared the storm-wrought fallen tree disaster on the Long Dock trail to the river. 5/21 – Bedford, HRM 35: The great blue heron rookery was a bit noisy with their collective vocalizing that sounded like chatter. Two nests had four very active nestlings without an adult guardian present. It would take a lot of food to feed those nestlings with both parents out hunting to keep up with their appetites. The other nests had a guardian present with nestlings only partly visible. Soon they will all be large enough to be seen. 5/21 –Yonkers, HRM 18: We had 35 preschoolers from the Eliza Corwin Frost School today at the Sarah Lawrence College Center for the Urban River at Beczak to learn about the river life in the Hudson. We caught four kinds of fish, including American eel, summer flounder, mummichog, and white perch. 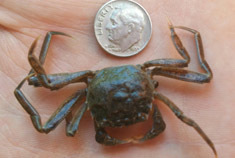 Among the crustaceans were shore shrimp and half-a-dozen blue crabs. 5/22 – Yonkers, HRM 18: A second grade class from Bank Street School in Manhattan joined us today at the Sarah Lawrence College Center for the Urban River at Beczak. Our seine caused much excitement when we beached it with five kinds of fish, including striped bass, northern pipefish, mummichog, and Atlantic tomcod. In the back of the net, we also found ten blue crabs and five shore shrimp. 5/23 – Esopus Meadows, HRM 87: Among our seining catch today, in the near shore shallows off Esopus Meadows, was an Oriental weatherfish (Misgurnus anguillicaudatus). The weatherfish probably came from a nearby tributary, the Esopus Klyne Kill, where it has been found. Oriental weatherfish are native to eastern Asia, were introduced into the United States in California in 1968, and were first reported in New York in 2009 by Doug Carlson from the Dwaarkill, a tributary of the Wallkill River. 5/23 – Millbrook, HRM 82: One of the signs of the waning spring season is the appearance of Dame’s rocket (Hesperis matronalis) in the uplands and along the river. This naturalized wildflower, native to Eurasia and brought to North America in the 17th century, comes in white, pink, violet, and purple. 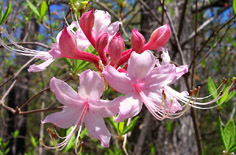 Carried by spring breezes, its wonderfully sweet fragrance fills the air from mid-May through early June. 5/23 – Fort Montgomery, HRM 46.5: I watched the Hudson River Sloop Clearwater glide past as I walked down to Mine Dock Park. A small lizard with a blue tail ran past me. It was my first skink of the season. 5/23 – Yonkers, HRM 18: A second grade class from Bank Street in Manhattan, a twin to the one that visited yesterday, arrived at the Sarah Lawrence College Center for the Urban River at Beczak with much anticipation. We hauled our seine and caught five kinds of fish as we did yesterday, including American eel, bay anchovy, Atlantic tomcod, mummichog, and northern pipefish. But this class caught twice as many blues crabs (20) and more than three times as many shrimp (18). 5/24 – Beacon, HRM 61: The river was a warm 75 degrees F, shorts and sandals weather. We hauled our seine with little expectations – in the absence of young-of-the-year fishes, spring can be a difficult time. As we beached the net we were surprised to see many glass eels and elvers, juvenile American eels, wiggling their way back into the swash after escaping our quarter-inch mesh. Beyond that, our highlight was several male banded killifish. 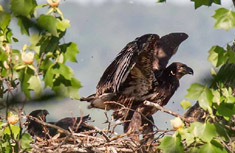 5/25 –Town of Poughkeepsie: The two nestlings in bald eagle nest NY62, now 63 days old, were very active, stretching their wings and probably wondering what they are all about. In another two weeks, they will be within range of anticipated fledge dates (72-90 days). Meet the Fishes and other Aquatic Life that are arriving at our Wetlab for "Summer School." Free. All equipment provided. Angling is wheelchair accessible. The Hudson River Estuary Program’s Trees for Tribs program offers free native trees and shrubs for planting along the tributary streams in the Hudson River Estuary watershed. Our staff can help you with a planting plan and work with your volunteers. Since 2007, Trees for Tribs has provided more than 40,000 native trees and shrubs for planting along 20 miles of stream with the help of more than 9,000 local volunteers. We are now accepting applications for spring planting projects. For more information about the program or to download an application, please visit the DEC website at: HudsonEstuaryTFT. Do you fish for striped bass in the Hudson River? You can share your fishing trip information and help biologists understand and manage our striped bass fishery. - Here’s how it works: Fill out a logbook provided by us whenever you fish on the Hudson River (by boat or shore). Record general location, time, gear used, what you caught (or if you didn’t catch anything) and return the logbook when you are done fishing. You’ll receive an annual newsletter summarizing the information in addition to the latest news regarding regulations and the river. NY Open for Hunting and Fishing Initiative: Under Governor Cuomo's Adventure NY initiative, DEC is making strategic investments to expand access to healthy, active outdoor recreation, connect more New Yorkers and visitors to nature and the outdoors, protect natural resources, and boost local economies. This initiative will support the completion of more than 75 projects over the next three years, ranging from improvements to youth camps and environmental education centers to new boat launches, duck blinds, and hiking trails. Read more about the Adventure NY initiative. For more information on planning an outdoor adventure in New York State, visit DEC's website at http://www.dec.ny.gov/outdoor.